By: Mark Schultz, Mel Rubi (Illustrator), Christopher Ivy (Illustrator), David Stewart (Illustrator), Pat Brosseau (Illustrator), Jon Foster (Illustrator), Mark Lipka. In the year 2032, John Connor and his resistance forces wage war against Skynet, a soulless super-computer bent on exterminating mankind. Sensing ultimate defeat, Skynet goes into hiding. Centuries later, it is awakened by stealth Terminators posing as human scientists. 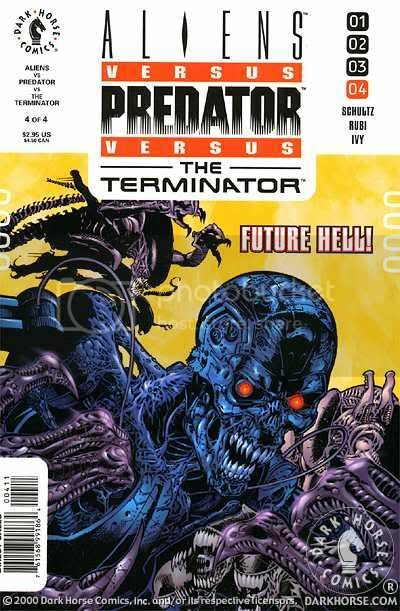 Now an even deadlier Skynet is using the science of the far future to create invincible Terminators by gene-splicing their human tissue with the DNA of the deadliest creatures in the galaxy -- Aliens! 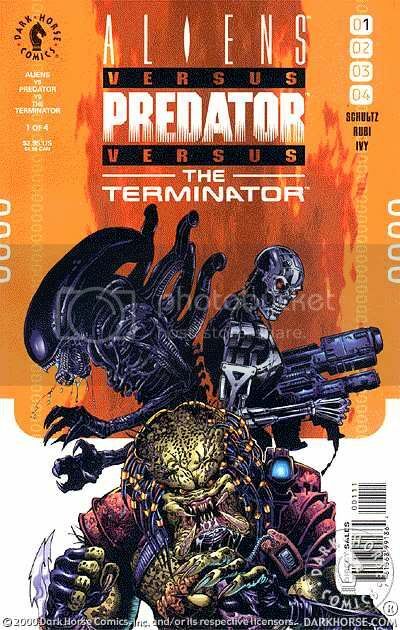 Earth`s only chance lies in the hands of a legendary heroine named Ellen Ripley and an uneasy alliance with another deadly non-terrestrial race, the man-stalking super-hunters known only as Predators! The Predators understand that Skynet threatens all life in the universe, and so they wade in on the side of humanity...but can these feral killers be trusted? Collecting the four-issue series. I thought it was the best comic I have read in my whole life. The comics were great in general. Loads of good action. Funny diologue. Bloody battle scenes. It was very enjoyable to read and see how they fit each serie\'s storylines together. Worked out perfect. For a crossover I give it a 4/5. Lets start by saying I am not a cross over fan. In fact the only reason i got this one was because I recieved it as a crhistmass gift. On a boring Sunday afternoon I finally opened it up and found it wasnt half bad. The first thing I noticed was the art. Superb job, by far osome of the best inking I have seen. 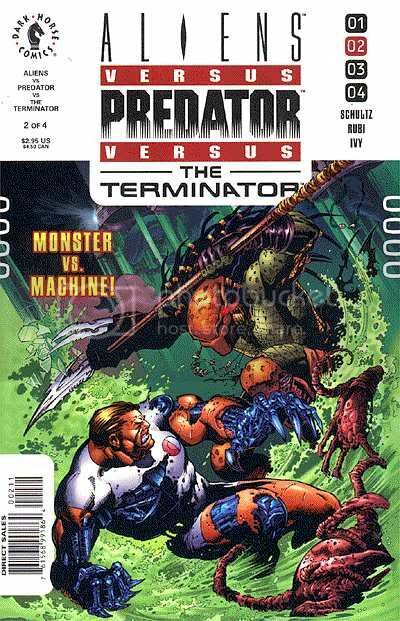 The termanators, the aliens and the predators look great. The ships in alien reseruction form are well down. The story, well Ellen Ripley is found by Call and her little band of merry men. The reason they come a knocking? Call has found a space station has been folling around with alien DNA. hus they are sent in to elimante the threat. Turns out the people operatin are Termanators who were sent into the future/past/whatever and are now making stronger, better termantors. 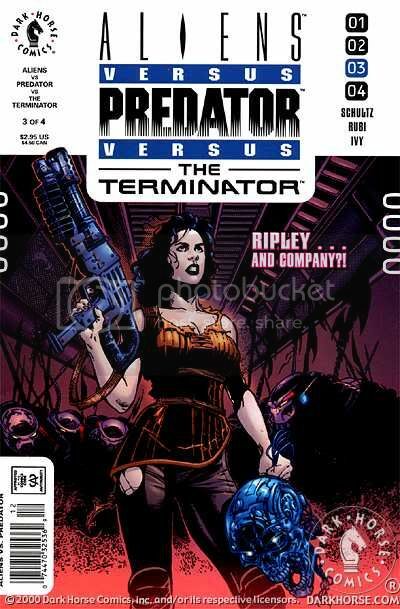 After a nice fight Ellen Ripley is abducted by the predators and she fights with them. 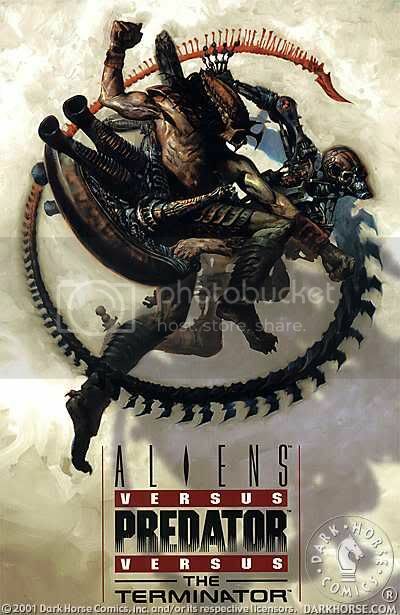 In the end the termantors are defeated, the aliens are all killed, and the predators die as well. The winners? Guessed it yet? The little band of Call's merry men, with 5 or 6 of them left. Story? Good one. Nice incorperation of the Termantors into it and the predatorrs plaing the galaxy police. Overall, I give the story a 5/5 stars. Great read.